Make the most of your shore-time when you visit Espiritu Santo and pre-book one of our amazing day trips! By booking one of our tours before you arrive you'll be able to start your adventure as soon as you disembark. Our friendly staff will be waiting to greet you when you arrive at Luganville Port at the information desk and can guide you directly to your waiting transport. The following tours are for two or more people and differ in price and length. Please discuss details with your guide before you take off, such at what time you need to be back at the wharf or in town. We hope you have the adventure of a lifetime and enjoy all that Santo has to offer! From everyone at the Santo Travel Centre, Vanuatu Tourism Office and the Department of Tourism - welcome to Paradise! Tam Tam Tour Operators offer 6 different day trip packages specifically designed for cruise day passengers. A minimum of 4 guests per tour applies. For full details and prices click on this link. See the highlights of Luganville town - including the handicraft market, Unity Park, fresh food market, copra mill, hospital, schools, and hear about Luganville's interesting history! Your guide will also point out important points of interest such as money exchange, visitor information centre, cafes and the duty free store. Discover Santo's unique WWII history! Learn about Santo's time as the second largest WWII allied military base in the Pacific as you visit Million Dollar Point, the remains of the Japanese Prisoner-of-War Jail and the miniature South Pacific WWII Museum. Snorkel Million Dollar Point and explore an amazing array of WWII relics. The sunken jeeps, boats, and tanks have formed an artificial reef that is teeming with sea-life. The perfect destination for ocean lovers and history buffs alike! Discover the unique culture of the Banks Islands, Torba Province. Taste kava and learn about traditional food preparation, join in with the custom dances and see the famous women's water music! 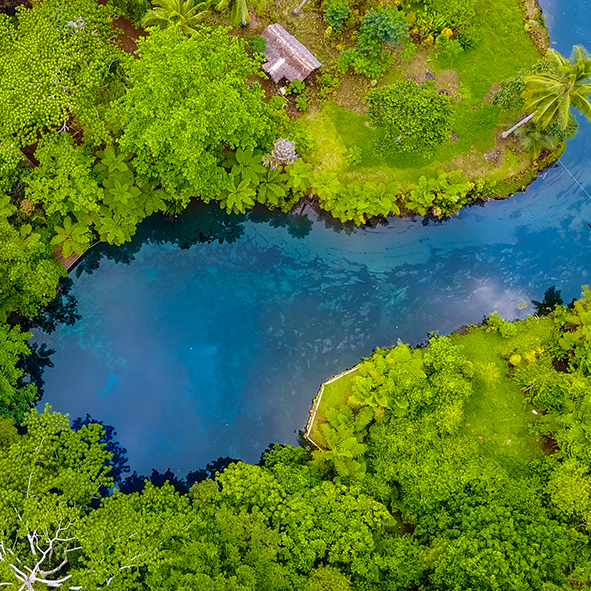 Venture up the east coast to Nanda Blue hole - a natural pool of clear blue spring water in the heart of the jungle. Facilities available include toilets, changing rooms, diving decks, and a cafe that serves light refreshments and drinks. Millennium cave is an adventure you don’t want to miss! This full day tour begins with an off-road drive from Luganville to Nambel Village in central South Santo. After a short walk you will arrive at Vunaspef village where you will begin your hike deep into the heart of the jungle. You will trek across bamboo bridges, canyon over and under large boulders, encounter bats and other cave dwellers, and enjoy a magical river ride surrounded by lush tropical rainforest. Venture up the east coast to Riri Blue hole. This stunning swimming hole is surrounded by overhanging jungle and is surrounded by shaded decks and chairs for your use. A short canoe tour up the river will cost you an extra 1000vt ($10AUD). Visit the most beautiful beach in Vanuatu - Champagne Beach! This pristine beach is on the north east coast of Santo and you will drive through coconut plantations and villages to get there. Once at the beach relax in the sun, swim and snorkel until you are ready to return to the ship. Visit stunning Port Orly Beach on the northern tip of Santo's east coast. Enjoy lobster, coconut crab or fresh fish right on the beach. Swim, snorkel or kayak the crystal clear ocean, explore the nearby village and islands, or treat yourself to an island-style massage right on the sand! Please note that flights and transfers not included.